C Diff Foundation ‘Making a Difference’ Award Presented to CutisPharma Inc. The C Diff Foundation today announced that it presented CutisPharma, Inc., its “Making a Difference” award as a special recognition of the significant contribution that CutisPharma has made to the C.diff. Community: helping the advancement of C.diff. awareness as well as expanding treatment options for C.diff. patients. (NEW PORT RICHEY, Fla.) — NEWS: The C Diff Foundation announced today that it presented CutisPharma, Inc., its “Making a Difference” award as a special recognition of the significant contribution that CutisPharma has made to the C.diff. Community: helping the advancement of C.diff. awareness as well as expanding treatment options for C.diff. patients. The award was presented at CutisPharma’s celebration of its upcoming launch of FIRVANQ(TM), recently approved by the FDA for the treatment of Clostridium difficile associated diarrhea and enterocolitis caused by Staphylococcus aureus, including methicillin-resistant strains. Upon launch, FIRVANQ(TM) will be the only FDA-approved oral vancomycin solution treatment commercially available, improving patient access and reducing pharmacist burden by no longer having to compound oral liquid formulations. The C Diff Foundation, a 501(c)(3)non-profit organization, established in 2012, is comprised of 100 percent volunteering professionals dedicated to supporting public health initiatives for C. difficile infection prevention, treatments, environmental safety, and support worldwide. For more information, visit: https://cdifffoundation.org/. CutisPharma, Inc., based in Wilmington, Mass., is privately held, specialty pharmaceutical company that has been the industry leader for 20 years in providing innovative solutions to pharmacists. CutisPharma’s FIRST(r) Unit-of-Use Compounding Kits have benefited millions of patients who are unable to swallow conventional oral dosage forms such as tablets and capsules and whose needs are not served by commercially available therapies. The Company’s first FDA-approved Kit, FIRVANQ(TM), will allow significantly broader patient access, convenience to pharmacists and patients alike by reducing the need for compounding, and serve as a potential cost-saving option to existing treatments. For more information, visit: https://cutispharma.com/. This entry was posted in C Diff Foundation, C diff Treatments, Pediatrics, Pharmaceuticals and tagged Are there liquid oral solution to treat Cdiff?, C Diff Foundation Making a Difference Award, Clostridium difficile treatment, CutisPharma, FDA approved oral solution, FIRVANQ, How is Cdiff treated?, Is there a liquid form of Vancomycin?, Vancomycin FDA approved oral solution, What is Cdiff? on March 18, 2018 by cdifffoundation. CutisPharma announced today, January 29, 2018, that the US Food and Drug Administration (FDA) has approved FIRVANQ™ (vancomycin hydrochloride) for oral solution, for the treatment of Clostridium difficile associated diarrhea and enterocolitis caused by Staphylococcus aureus, including methicillin-resistant strains. This entry was posted in C diff Treatments, C. diff. for Healthcare Providers, Pediatrics, Pharmaceuticals and tagged c diff, c difficile, C. diff. infection, CDAD, cdiff, Clostridium difficile associated diarrhea, CutisPharma, FIRVANQ, Is there a liquid form of Vancomycin?, Neil I Muni MD MSPH, Oral solution Vancomycin, Stuart Johnson MD, Vancomycin Oral Liquid Formulation on January 29, 2018 by cdifffoundation. 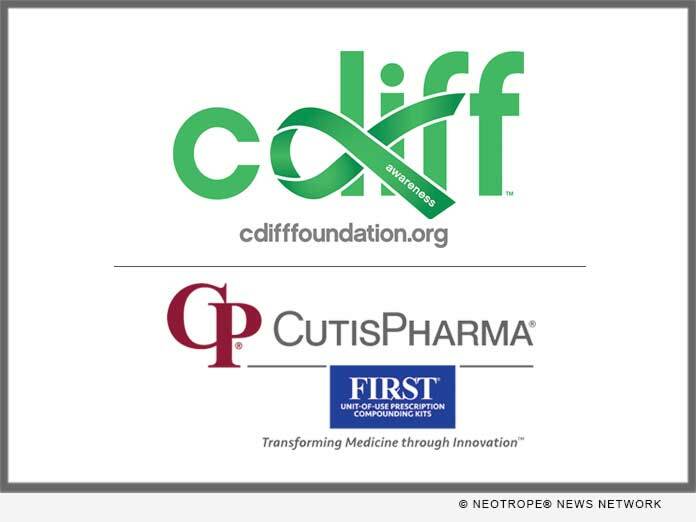 CutisPharma and the C Diff Foundation announced the launch of a partnership beginning on November 1, 2017, the first day of Clostridium difficile awareness month. As part of the partnership, CutisPharma awarded an unrestricted grant to the Foundation to further support its awareness efforts. CutisPharma, Inc., based in Wilmington, Mass., is a privately held, specialty pharmaceutical company that has historically developed and distributed kits used by pharmacists to safely create compounded medications for nearly 20 years. The Company’s products include oral solutions and suspensions, such as antimicrobials, mouthwashes, and PPIs; topicals, including hydrocortisone; and suppositories, including progesterone VGS. CutisPharma’s FIRST Unit-of-Use Kits have benefited millions of patients who are unable to swallow conventional oral dosage forms such as tablets and capsules and whose needs are not served by commercially available therapies. For more information, visit www.cutispharma.com. This entry was posted in C Diff Foundation, C diff Treatments, November C;diff Awareness, Pharmaceuticals and tagged c diff treatment, C. difficile treatment, Clostridium difficile awareness, Clostridium difficile treatment, CutisPharma, CutisPharma FIRST, CutisPharma FIRST kits, Pharmaceutical Compounded Medications on December 4, 2017 by cdifffoundation.